Excellent product. High quality and easy to order. Ships quickly. Highly recommend. We have been taking these vitamins for years. We feel a noticeable difference when we try others. We highly recommend them! As previous reviews testify, we have been taking Cooper Complete for years. We have had very few colds or any serious illness. We are 77 and 76. We work out as many times a week as possible. God has blessed us with opportunities to travel in our RV to many places in the US including a 3-month tour to Alaska. During all our travels, we stayed well and active. Of course, our Cooper vitamins were one of the first things on our list to load in our RV! We have faith that Cooper continuously watches and makes changes in their products that benefit their consumers. We also take Omega 3 and Eye Health products. Thanks Cooper for taking such an interest in helping your customers stay healthy. I have been taking Dr. Cooper’s Original Multivitamin, Iron Free for nearly twenty years and I still think it is the best daily multivitamin. The vitamins keep me healthy and energetic, and at age 77 it is the best vitamin I trust with my health. I remember Dr. Cooper advocated prior to these vitamins that vitamins should be digested well instead of just flush out of the body. These vitamins are high quality providing me good health all these many years. I am thankful for Dr. Cooper’s multivitamins! Love the product! Customer service they provide is the BEST! Still taking the Cooper Complete. Has been part of my daily ritual for as long as it has been available. Approaching 84 and still running; so why quit now. I’ve been taking these for over 20 years, over 60 yrs old, still surfing Hawaii winter waves, playing senior softball and working out! I highly recommend these supplements for active lifestyles! My husband and I have been taking Cooper Complete for many years. We like the easy to swallow tablets. They also have some important additions that other vitamins don’t include, such as Vitamin D, CoQ10, and many important vision vitamins and ingredients. However; the thing I appreciate the most is that they continually review their vitamins and update them as research indicates. I highly recommend the Cooper Complete vitamins. I have been using the Cooper Complete Original multivitamins for almost 20 years. Before taking the Original multivitamin I used to have multiple colds per year, which went to basically none. I believe they are great. I have been taking the Cooper Complete Iron Free for over 20 years. I am now 71 years old and my health couldn’t be better. I am never sick or lack for energy or stamina every day to enjoy my life. I am repeating myself but my Cooper vitamins are a part of my life. Now 83 and run daily and exercise and I feel the vitamins are contributing to my ability to stay active. Just lost another good friend and experiencing too much of that recently. Met Dr. Cooper years ago while he was visiting Touro Infirmary in New Orleans. They served breakfast of eggs, biscuits, sausage, bacon and ham. Lots of jelly. I asked him what did he eat and he replied he ate before the visit! Thank you for your Cooper Complete Nutritional Supplements recommendation. And thank you too, for sharing this story about Dr. Kenneth Cooper. Your story sounds exactly like something Dr. Cooper would say as he absolutely walks the talk of health and wellness. Dr. Cooper has shared that he is regularly asked what he eats as a typical breakfast, lunch or dinner and when dining out in a group he is accustomed to others watching to see what he’s going to have. If he were writing you, he’d report he focuses on eating well, and definitely has occasional treats like everyone else. Thank you for your glowing testimonial of the benefits you’ve enjoyed while taking Cooper Complete Original Iron Free! I have studied and trained at the Cooper Institute…it has changed my lifestyle! Been using this product since it hit the market…61 yrs. old, retired and still surfing Hawaiian winter waves! Mahalo Dr. Cooper, you are “Da Man”! I have taken Cooper Complete since it came on the market. The formula is as it states, “Complete.” Now in my 70’s, I attribute my youthful appearance to the continued use of this formula, and clean living. I have subscribed to Cooper complete since it began. I used the Elite version when I ran marathons and switched to the lower Complete with less vitamin E after completing 40 marathons. I am 83 and active running most days, tennis etc. and won’t change anything in my life including Cooper Complete. Your message makes our day. Thank you for sharing your health journey with us. We’re glad to know Cooper Complete Elite Athlete supported you throughout your marathon training years. It’s a major accomplishment to complete a single marathon, let alone 40 marathons! Fun Fact – Dr. Kenneth Cooper discovered professional athletes were developing cancer at high levels despite seemingly active and healthy lifestyles. With a team of physicians and researchers, Elite Athlete was created to help keep serious athletes healthy and performing at their full potential. We are delighted to know that Cooper Complete has helped you remain active throughout your life, from running 40 marathons to continuing to exercise daily at age 83. Congratulations on your achievements! We appreciate your loyalty and trust in us, and that you took the time to share your experience with us. More than 10 years ago my doctor recommended that I take a multi-vitamin. I chose Cooper Complete and made it part of my daily routine. I have fewer colds and the ones I have are less severe and of shorter duration. My digestive system also functions better than it did prior to taking the vitamins. Cooper Complete seems to be the help my body needed so I will not change vitamins. If it ain’t broke don’t fix it! I’ve taken Cooper Complete since it was first offered after Dr. Cooper’s first doctor panel. The product delivers all the required nutrition. I’d never switch. A friend recommended Cooper products many years ago, I have been taking Cooper Complete for probably 20 years. I have such confidence in all the Cooper products and plan to continue taking what I consider the best available — to me this is Cooper. My wife is a RN and she got us started on Cooper Complete vitamins over a decade ago. Before I was having two or three colds a year. Since we started the vitamins, I have only had three colds period. Also, the three I have had were light and were gone in less than a week whereas before they would last two weeks. It was difficult for her to convince me, but I am convinced now. Taking Cooper Complete has lessened recovery time substantially, feel energetic and overall healthier. It great to have the confidence knowing you are doing the best for your long term health and to meet your goals. For years I wouldn’t take the “8 per day” since they smelled so horrible. My husband has continued to take them, and I realized lately that the horrible smell is gone. I have now ordered them for myself also. I have been taking Cooper Complete since Dr. Cooper announced it’s availability at a lecture he gave at Touro Infirmary in New Orleans. I used the Elite Athlete while running marathons (40) and after retiring from racing switched to the standard Cooper Complete. I am on the automatic supply every two months. I have referred many running friends to the product. Cooper Complete Original Multivitamin Iron Free is the most comprehensive multivitamin and mineral supplement in the Cooper Complete® line of vitamins and nutritional supplements. Clinical research shows a Cooper Complete Original Multivitamin Iron Free lowers the high-sensitivity C-reactive protein, a key marker of inflammation in the body related to heart disease, diabetes, and autoimmune diseases. Original Multivitamin Iron Free contains 50 mcg (2,000 IU) vitamin D3, Cooper Clinic’s baseline recommendation for optimal bone health. Original Multivitamin Iron Free contains 6mg of Lutein because of its ability to help eyes filter harmful blue light. Original Multivitamin Iron Free is a complete multivitamin recommended for men or women who have completed menopause and no longer have a monthly cycle, as supplemental iron typically is not needed. This product contains no gluten, milk/dairy, or preservatives. The daily recommended serving of Cooper Complete Original Multivitamin Iron Free is 8 tablets (4 tablets twice daily with meals). 240 tablets per bottle. 30-day supply. Vanilla-flavored easy swallow coating. As a dietary supplement, adults take 8 tablets (4 tablets twice daily with meals) or as directed by your physician or healthcare professional. 240 tablets per bottle. 30-day supply. Vanilla-flavored easy swallow coating. Other Ingredients: Microcrystalline cellulose, hydroxypropyl cellulose, tablet coating (titanium dioxide, cellulose gum, dextrose, cellulose, talc, caramel, glycerin, natural vanilla flavor), croscarmellose sodium, carnauba wax, stearic acid, silica, and vegetable stearate. OPTISHARP® Natural is a trademark of DSM. 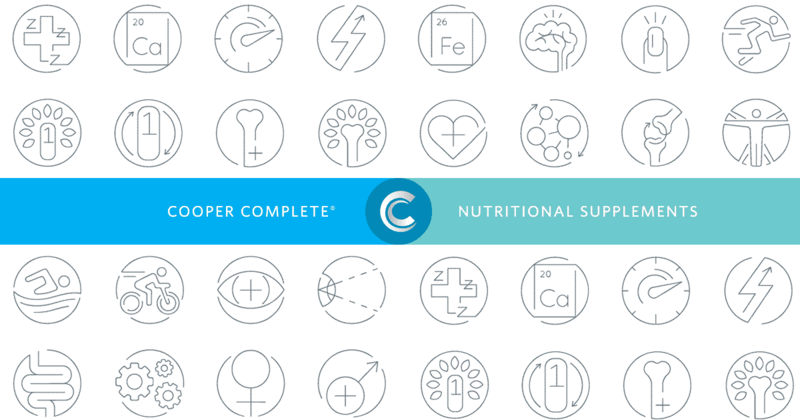 Cooper Complete Original Multivitamin Iron Free is NOT vegetarian, vegan, “raw,” or kosher. Why do I need to take four tablets twice a day? Splitting the daily serving of eight tablets (four in the morning with breakfast and four in the evening with dinner) allows the body to maintain a sufficient level of the water-soluble antioxidants needed to fight off free radicals. Why do all Cooper Complete multivitamin and mineral formulations have a high dose of B12 compared to the daily value? One objective of Cooper Complete multivitamin and mineral supplements is to lower the homocysteine level. Research indicates excessive levels of homocysteine may increase the risk of stroke, certain types of heart disease and peripheral artery disease. Our products contain preventive levels of both vitamin B12 and folic acid, which together work to lower homocysteine levels. Is Cooper Complete peanut, garlic, corn and pepper-free? Yes. 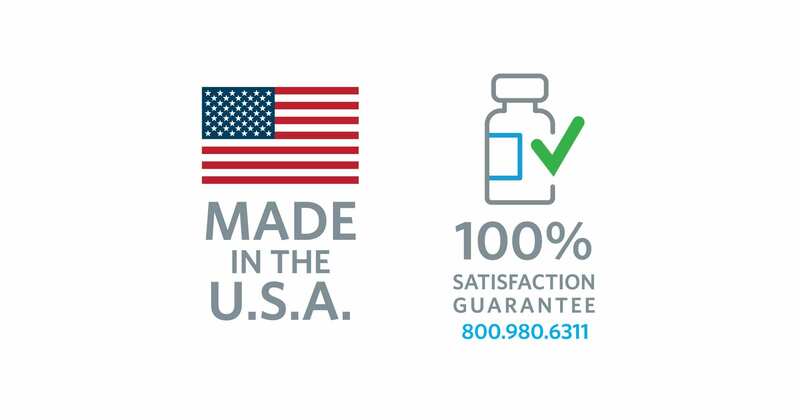 However, we outsource the actual production of our products to a manufacturing facility that produces other supplements. It is possible that other products are produced on the machines might contain any of these ingredients. While the equipment is cleaned completely between different runs in order to avoid cross-contamination, the potential risk remains. Is Cooper Complete Iron Free vegetarian, vegan, “raw” or kosher? No. Cooper Complete Iron Free is not vegetarian, vegan, “raw” or kosher.